By training your ear to these common chord changes, starting with simple two-chord movements, you'll gradually develop the skills you need to improvise and write your own solos confidently to a lot of music out there (including your own songs). Tip: Youtube has a tempo change function. Look for the cog icon in the bottom right of the video screen. The 5 (typically referred to using the Roman numeral, V) chord is so-called because it's built on the 5th degree of the diatonic scale. The V chord root can also be seen as a perfect 5th interval from the tonic (1 or I) chord root. If you're unsure what that means, you can learn more about intervals on this site, but the main thing is you get to know the sound of this movement between 1 and 5 in any key. 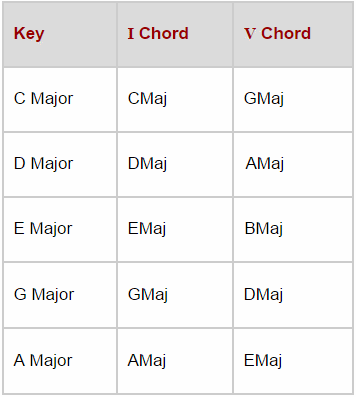 Using the table, we can see what the V chord would be in the most common major keys. Strum the chords (starting on and emphasising the I chord) so you can get a feel for this I - V relationship. 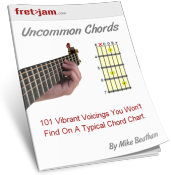 While the V chord can be played as a basic major chord, it's often played as a dominant 7th (e.g. G7) which enhances its natural tension. Because of this tension, the V chord is typically used as a pre-tonic chord, which means it naturally "pulls" and resolves to the I. When the chord changes are quick (for example in the same measure), you can use the same major pentatonic scale of the key over that V chord. The major and minor pentatonic scales, when built on the tonic position, are especially versatile in their ability to "cover all the chords" of a key. However, if the V chord is prolonged, which it often is, you'll get more melodic "mileage" by changing to major pentatonic on the V chord's root. For example, in the key of C major, we'd play C major pentatonic over the Cmaj chord, but then change to G major pentatonic over Gmaj or G7. What this does is ensure the major 3rd, which is a strong harmonic tone in major chords, is voiced over the V chord. This isn't just theoretical dogmatism - you'll find being able to voice that 3rd over V carries a certain emotional weight that would otherwise be absent with the usual "one scale per key" approach. But you really need to hear it for yourself. 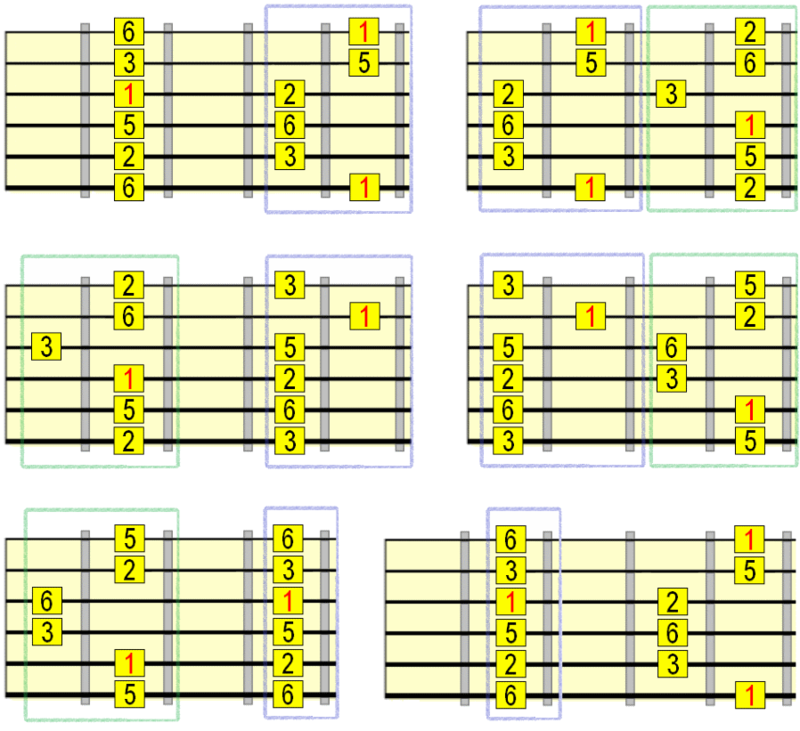 In the jam video we were taken through the different scale positions for each chord. 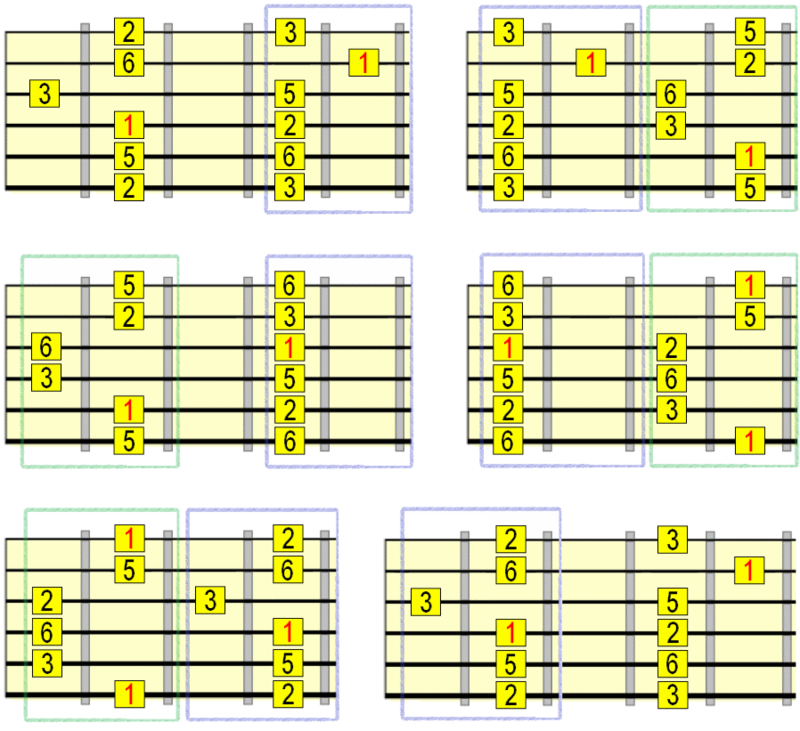 Below you'll see these positions mapped out for both the I and V chords (select the tab above the diagram for your chosen chord). The coloured boxes show you how each position overlaps with the next/previous. So no matter where you start, the overall sequence of patterns retains its order. Remember, all we're doing is flattening the 1 of the tonic (I) major pentatonic pattern to get our V chord pentatonic scale in the same position. Another way to see it is the 5 in the tonic pattern becomes the 1 of the V pattern. Hence, 5 chord being built on the 5th scale degree. Here you can download the jam track featured in the video (Cmaj - G7) and the same track in another key (Emaj - B7). Hopefully, if you've been through this series, you're getting increasingly confident with navigating the major pentatonic scale through chord changes.